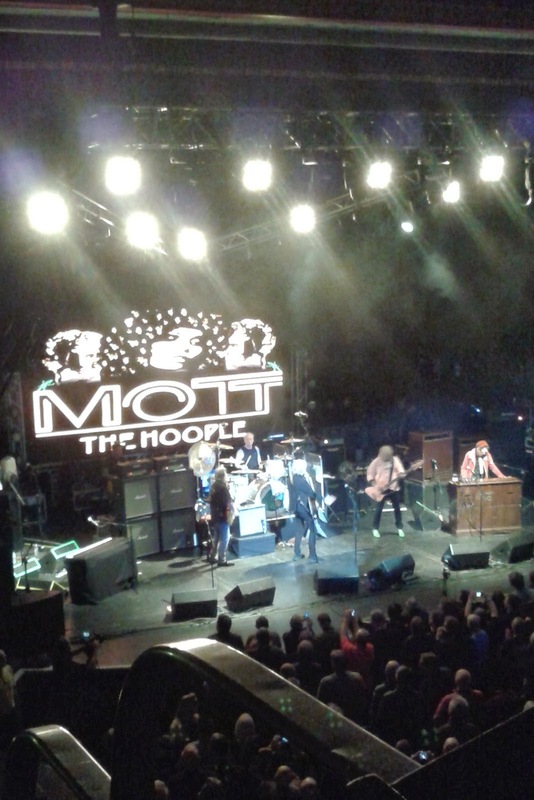 Although by no stretch of the imagination a Mott The Hoople aficionado, I do recall their early-seventies singles with a deal of fondness, so pitching up to see these guys play felt like another tick on the old musical Bucket-list. Formed in 1969, the band spent the following couple of years incessantly gigging and building up a reputation as a fun live attraction. Converting this status into sales of bits of vinyl proved to be impossible however, and early ‘72 found the band on the verge of splitting. In stepped celebrity-fan David Bowie with an offer to produce Mott’s next album, and to present them with a song (All The Young Dudes, of course). Cue hit single, hit album and a rethink on the break-up. 1973/74 saw the band enjoy a run of incursions into the UK singles charts, before vocalist Ian Hunter’s departure effectively heralded the demise of MTH. 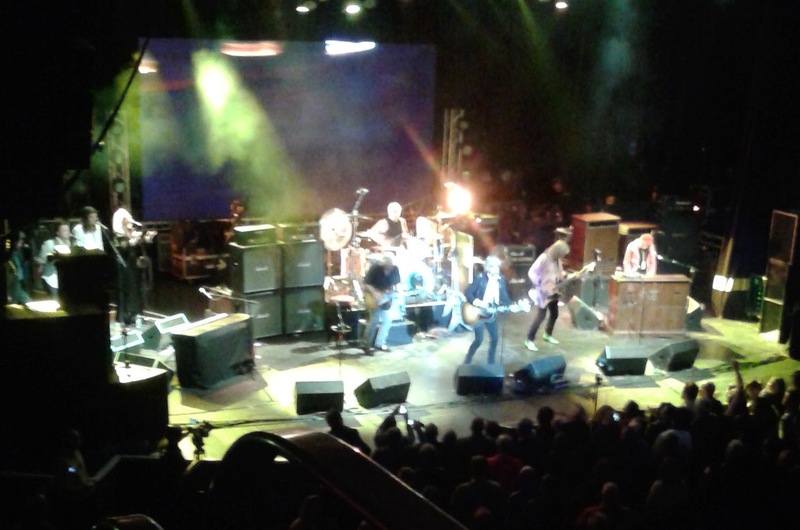 Guitarist Mick Ralphs earlier having decamped to form Bad Company. But Mott fans are nothing if not loyal, and a series of reunion gigs in 2009 were so successful the lads decided to repeat the trick in 2013. The set this evening kicked off with a brace of fine rockers in Rock and Roll Queen and One of the Boys. The next ‘un, The Moon Upstairs also hit the mark – but given much of it appeared to have been lifted from The Who’s Won’t Get Fooled Again, then so it should. The problem of a not particularly strong back catalogue then reared its ugly head, and the following hour or so was a decidedly patchy concoction; ranging from the really rather rubbish (Verden Allen’s Soft Ground) to the delightfully raucous Walkin' With a Mountain. But the majority of this mid-gig lull was, to my ears anyway, just so much run of the mill Seventies pub-rock fodder. A few acoustic/Hunter-at-the-keyboard pieces were thrown into the mix, but these were generally equally forgettable. 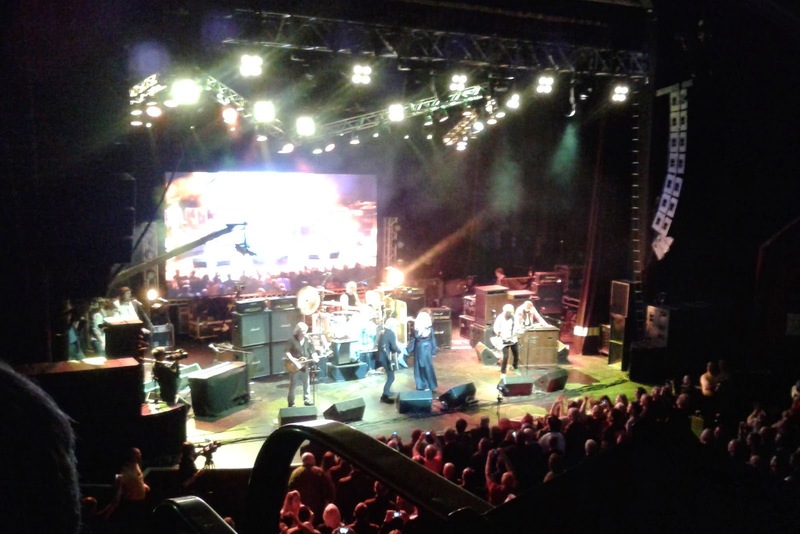 But it was well worth enduring the mediocre stuff just to hear the greatest hits segment which closed the set, and I would have paid the entrance money alone just to hear Ralphs' playing that iconic opening to All The Young Dudes. And Roll Away the Stone was just superb. Maybe bring a sax player along next time boys, though. A word on Ian Hunter: a more-than-sprightly 74 years old these days, he bopped around if not quite like a teenager, then certainly with a deal more vim and vigour than most guys (i.e. me) twenty years his junior could. Still pencil-thin and sporting his trademark curls and large shades, his voice (except when his mike failed during Golden Age of Rock ‘n’ Roll) sounded as powerful and distinctive as on those hit singles. Although I noted, when his face lit from below appeared on the big screen behind the band, he did look disconcertingly like he was wearing Peter Gabriel’s “Musical Box” Old Man mask.